Deutsche Bank shares plunged 7 percent, falling to their lowest level since 1983 despite a statement by Cryan that the bank had not sought government assistance in its negotiations with the DoJ. Shares in Deutsche Bank, which has been troubled by persistent reports about its financial ill health, have fallen 55 percent over the past year. Last month, the International Monetary Fund described Deutsche Bank as the weakest link in the global financial system and its position has only worsened since then with the imposition of the DoJ fine. Since then, however, its position has only got worse as efforts to restore profitability by cutting costs have proved unsuccessful. Then came the DoJ fine. It has sparked fears that businesses that were supposed to provide it with a boost will not go ahead because counterparties will be reluctant to deal with the bank and it will start to lose revenue because of the bad news surrounding it. Like a flock of vultures, hedge funds have been circling with a number of them shorting Deutsche Bank shares in the expectation they will rapidly fall. The turmoil surrounding Deutsche Bank is only a particularly sharp expression of the developing crisis of the entire European banking system flowing from the 2008 financial meltdown. Speaking on Monday, European Central Bank president Mario Draghi said there was an “overcapacity of banks in Europe” and that government should create the legislative conditions for consolidation to take place. “Do you really want to have a system that only reaches the right dimension after protracted failures? Banks in Europe should be strong and profitable. One of the reasons for low profitability is exactly overcapacity,” he said. If Deutsche Bank were to fail it would not stop there. Because of its connections with other banks and financial institutions, the effects would rip through the entire European financial system and extend globally. No one knows the full extent of the consequences but some commentators have already pointed to the possibility of a “Lehman moment” – a reference to the collapse of the US investment bank Lehman Brothers which sparked the global collapse of 2008. First in line for a major crisis would be the Italian banking system, where it is estimated that there are €360 billion of bad loans on the books, four times the level in 2008 and comprising 17 percent of total loans outstanding. In addition to mounting economic problems, the crisis surrounding Deutsche Bank has a major political component. It is significant that the action against the banks has been launched not by the regulatory authority, the Securities and Exchange Commission, but by an arm of the White House, the Department of Justice. The size of the fine also points in the same direction. 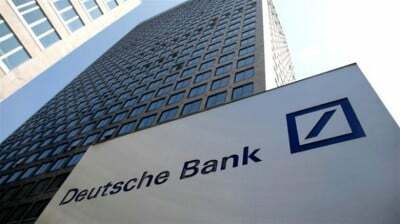 “The DoJ is asking for 10 times more from Deutsche than they asked from any of its US peers, with no disclosure—it is extortion,” Davide Serra, the founder of a company which invests in the debt of European banks told the Financial Times. The imposition of the fine has come in the midst of rising political and economic tensions between the US and the European Union and particularly Germany. The decision by the EU to impose a €13 billion payment on Apple for back taxes over a deal with the Irish government which brought strong opposition from major US corporations and the US treasury. The row over Apple was followed by statements from Germany and France that have virtually ended negotiations over the US push to establish a Transatlantic Trade and Investment Partnership (TTIP) to cover its trade and financial dealings in Europe. Together with the Trans Pacific Partnership, covering the Asian region, but excluding China, the US regards the TTIP as crucial to maintaining its position of global economic dominance. The crisis over Deutsche Bank points to two interconnected processes. First, far from having been resolved, all the contradictions of the global financial system that exploded eight years ago not only remain, but have worsened. Second, that despite all rhetoric about cooperation and collaboration issuing from major economic summit meetings of world leaders, the global economy and financial system is increasingly becoming a battleground of each nation against all.